This screen combines a high contrast projection layer and unique optical filter that rejects external light, providing stunning images with superior brightness, contrast and resolution. 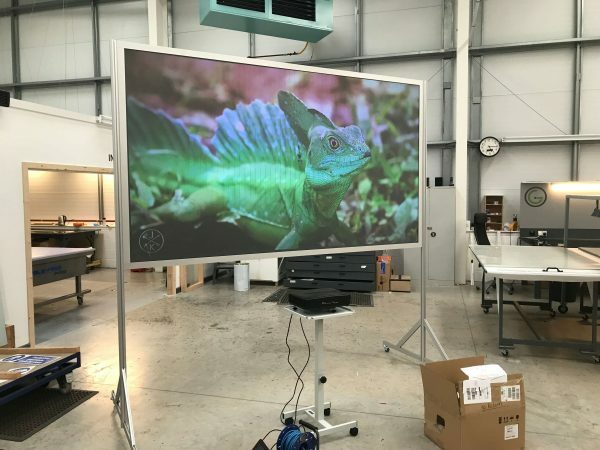 Our SunScreen Ultra Short Throw front projection screen is designed specifically for the latest ultra short throw (UST) projectors (around 0.4 lens and shorter). In addition, it is a unique light-rejecting screen that filters out ambient light, excelling in brightly lit environments. The screen combines a high contrast optical projection layer with the light-rejecting filter to give a stunning performance in high ambient light, bright daylight and even sunlight. Images are reproduced without the hot spotting of other screens that rely on high gain to overcome ambient light. Our Ultra Short Throw front projection screen gives a professional quality image where space is at a premium. SunScreen outperforms LCD/LED panels that can prove to be far more expensive, yet still suffer fade from high ambient light. 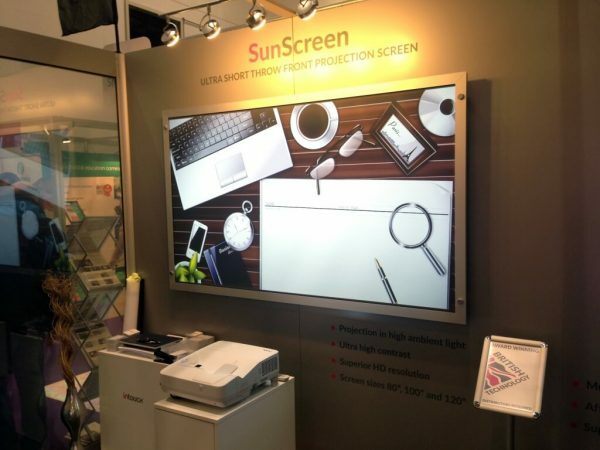 SunScreen is the ideal choice for corporate, education and general digital signage applications, especially where bright daylight or artificial light easily washes out other projection screen surfaces. The louvred micro-optical light-rekecting screen filters bright light hitting the screen from above, while at the same time allowing the highly reflective projection surface to capture light from the projector below, displaying images with stunning contrast, colour and resolution. SunScreen encapsulates everything that Pro Display stands for: innovative optical projection screen technologies that deliver professional display performance in all lighting conditions, even from lower end projectors. This ultra-short throw, light-rejecting front projection screen is the ideal choice for corporate, education and general digital signage applications. For screen sizes above 120” diagonal we recommend using 72” screens as modular panels to create large format projection walls. This product is specifically designed for UST projectors with a lens throw ratio 0.4:1 or less – please call for details. View Pro Display’s UST Laser Projector here. We manufacture in Britain and ship worldwide – if you need further information, a pricing quote, or want to discuss ideas for using our Ultra Short Throw Front Projection Screen please complete the form below, or call us on +44 (0)1226 361 306.